Principal Investigators J. Edward Colgate and Michael Peshkin, both Professors of Mechanical Engineering, are partnering with Ford Motor Company (“Ford”) to test haptic technology on touch screen displays for automobiles. The investigators had previously developed a novel haptic technology – the Active TPaD – that lets a user feel and interact with controls on a touch screen, even in the absence of vision or audition. In 2010 Ford launched its “MyTouch” technology, a touch screen in-car communications and entertainment system, in its cross-over vehicle, Edge. Ford has expanded the MyTouch offerings in new vehicles this year including the Focus. For the research project, Ford has made available its VIRTTEX driving simulator to test two common driver-to-vehicle interaction scenarios: adjusting a slider (e.g., for air conditioning), and locating a button (e.g., such as a volume control knob), in both cases by touch alone. During the project, the investigators will work with their Ford colleagues to prototype the scenarios, test usability, and assess the overall suitability of the Active TPaD for the vehicular environment. Using the simulator, the team will evaluate a simulated driver’s ability to complete tasks involving sliders and buttons while driving in various road conditions (e.g., varying degrees of road vibration). The goal of the project is not only to test the effectiveness of the Active TPaD in realistic driving conditions, but also to evaluate an innovation for touch screens that could reduce driver distraction. A Midwest-based highway authority deploys traffic monitoring cameras over 50 percent of its highway network using fiber-optic communications. Even though the authority occasionally uses cellular connections for some applications, its operations center generally avoids wireless cellular communication networks that result in “low resolution” or “poor quality” video streams. A team of Northwestern Professors with the department of Electrical Engineering and Computer Science (EECS), seeks to improve the quality of video transmitted over lower bandwidth wireless networks for traffic analysis applications such as vehicle tracking. The team previously developed iTRAC, a video processing and compression algorithm, that required 90 percent less bandwidth than widely-deployed state-of-the-art compression systems to connect remote cameras to a powerful central data processing location (command center) over wireless communication networks, while maintaining video integrity for analytics applications. The reduction in bitrate enabled by iTRAC technology makes it attractive for video surveillance applications using cellular wireless networks. However, another challenge arises in cellular networks – data loss (packets of information fail to transmit from a camera to central office) – is common. Therefore, the investigators will design and test iTRAC Wireless which will incorporate new algorithms to address the challenge of “lossy” cellular networks in the context of automated vehicle tracking. The intended impact of this research project is the wide spread deployment of low cost wireless camera systems for traffic video surveillance applications, enabled by a substantial reduction in bandwidth requirements provided by iTRAC Wireless. The research team will partner with Packet Video Corporation, a market leader in multimedia video technology for cellular networks, to field test iTRAC Wireless in late 2011 or early 2012. Working as an operations research support team for Fisher & Arnold, Inc., the team of undergraduate students subdivided a county (Tipton County, TN) into smaller, contiguous search zones, equally distributing work based on factors such as population density and road accessibility. This approach allows for a more equal distribution of work among the search teams and helps minimize emergency response time. The proposed solution makes use of emergency service numbers (predefined emergency response zones recognized by multiple agencies including police and fire departments) to ensure that teams can reach every household in their search regions without leaving those regions. PhD student de la Torre supported the team with his expertise in routing models and learned more about the GIS routing tools that the team used for their client. While the students achieved real world operations research experience, de la Torre gained valuable experience in research mentoring as a dual benefit of the project. Preliminary results suggest that Enhanced Search Zones are successful in enabling a more rapid search and rescue operation. More than twenty-five Northwestern University Transportation Center (NUTC) faculty members and students shared research findings at the 2011 Transportation Research Board (TRB) Annual Meeting in Washington, D.C. NUTC had a strong involvement in at the 2011 TRB Meeting. NUTC faculty affiliates, researchers, and students organized and chaired sessions, led panel discussions, conducted workshops, presented papers, and gave poster presentations on a variety of transportation-related research. Presentation topics included network modeling, driver behavior, data and information innovations for researchers, and operations and traffic management. NUTC faculty and research affiliates presenting at TRB were David Boyce, Jing Dong, Kay Geary, Frank Koppelman, Hani Mahmassani, Marco Nie, Roberto Sarmiento, Joe Schofer, Surendra Shah, and Kuilin Zhang. NUTC students presenting at TRB were Hamed Babai, David Baumgartner, Charlotte Frei, Samer Hamdar, Michael Huang, Lan Jiang, Jiwon Kim, Emily Kushto, Omer Verbas, Alireza Talebpour, Xing Wu, and Zitao Zhang. 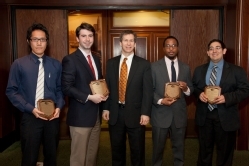 NUTC also hosted its annual TRB Reception and Alumni Reunion. 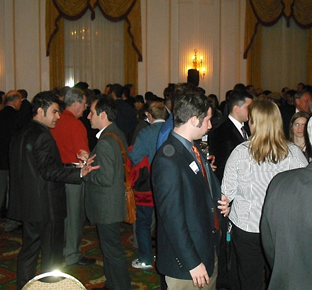 The popular event attracted more than 400 guests and was one of the largest reception events at TRB. NUTC’s 400 guests were members of NUTC’s expansive network of transportation professionals representing industry, academia, and government. CII’s mission is to promote and support the business of international trade and the intermodal container transportation community. CII has supported more than $500,000 worth of scholarships since 1992. Luis de la Torre is a third year PhD student studying under CCITT principal investigators Karen Smilowitz and Irina Dolinskaya in the department of Industrial Engineering and Management Sciences. De la Torre decided to come to Northwestern because of its interesting and unique opportunities, especially those in humanitarian logistics. 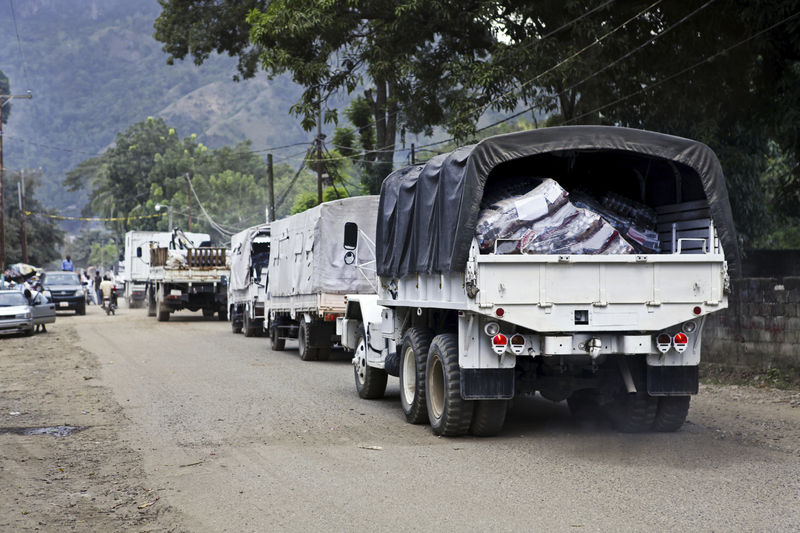 According to de la Torre, humanitarian logistics is exciting “not just from the side of application, but also because it presents challenging operations problems.” Currently he is researching the distribution of goods to rural recipients with the overall goal of helping to make relief more equitable and efficient. To conduct his research, he relies on communicating with aid workers to better understand how they make decisions of allocation when supplies are limited and to learn about challenges relief organizations face. Prior to coming to Northwestern, de la Torre studied mathematics and economics at the University of California, Davis. In his spare time, he plays oboe in the Northwestern University Philharmonia. Zhaofu Chen is currently a Ph.D. student in Electrical Engineering and Computer Science in Northwestern University, Evanston, IL. He received the B.S. degree in Information Science and Engineering from Zhejiang University, Hangzhou, Zhejiang, China, in 2008, and the M.S. degree in Electrical and Computer Engineering from University of Florida, Gainesville, FL, in 2010. He joined the Image and Video Processing Lab (IVPL) in Northwestern University in 2010. His advisor is Dr. Aggelos K. Katsaggelos. His research interests include image and signal processing, video compression and multimedia communications. David Meyer is a first-year PhD student in the Department of Mechanical Engineering working with professors Ed Colgate and Michael Peshkin in the field of surface haptics. He received his BS in Mechanical Engineering from Rice University. Meyer's research focuses on generating tactile sensations on touch screen interfaces by taking advantage of the finger's interaction ith high-frequency vibrations in glass. Meyer is also the member of the Northwestern Curling Club. Joe Mullenbach is currently a first-year graduate student in the Department of Mechanical Engineering. He is advised by professors Edward Colgate and Michael Peshkin. Mullenbach's research is in creating haptic effects that are usable in a driving environment, and that would allow the driver to interact with vehicle touchscreen controls using solely the sense of touch. Mullenbach is also an entrepreneur. While an undergraduate, he founded NewWater LLC, now Renovo Water, which aims to commercialize a water filtration technology invented by University of Minnesota faculty. In April the Northwestern University Transportation Center (NUTC) hosted a half-day symposium focused on overcoming the strategic, technical and operational challenges toward the implementation of high-speed passenger rail service in the United States. At the symposium, Karen Hedlund, Chief Counsel of the Federal Rail Administration, and Joseph Shacter, Director of Public & Intermodal Transportation at the Illinois Department of Transportation (IDOT), discussed their goals and shared vision for the United States and Illinois, provided updates on current infrastructure projects – notably CREATE, the Chicago Region Environment and Transportation Efficiency Program – and outlined future priorities for high-speed rail. According to Shacter, passenger rail ridership in between Chicago and St. Louis has increased 200 percent between 2006 and 2010, even without high-speed rail enhancements. IDOT expects ridership to further increase with high-speed rail investments that it projects to reduce the Chicago to St. Louis travel time by 40 minutes and improve travel time reliability by 80 percent or more. Following the presentations by FRA and IDOT, four technical presentations highlighted rolling stock technologies, scheduling challenges involving freight and passenger trains sharing the same tracks, the art and science of demand forecasting for proposed HSR services, and the role of independent review processes in the conduct of HSR studies intended to inform policy and investment decisions. “US high-speed [rolling stock] technology is nearly ready,” Jim Lindsay, Vice President & Customer Director US and Canadian Railroads at Alstom, confidently stated at the outset of the technical program. In the northeast corridor, service already exists at speeds up to 125 mph. For higher speeds, however, many technology choices remain to be made such as tilting vs. non-tilting and articulated vs. non-articulated rail car designs. Lindsay also noted further advanced technology implementations will be required to operate a complex rail system involving passenger and freight rail with close headways, higher speeds, and multiple tracks. Unlike European rail networks or the northeast corridor in the United States, many higher speed rail passenger networks will continue to operate on the freight rail network owned by the freight railroads. Krishna Jha, Vice President of Research & Development at Innovative Scheduling LLC, outlined the complexity and necessity of optimization and simulation based scheduling techniques to greatly improve service quality and reduce operation costs of passenger rail. Jha explained that scheduling techniques developed for the freight railroads are applicable to the freight-passenger rail scheduling problem as well. Upon consideration of millions of decision variables and constraints over a space-time network, including line capacity, train capacity, yard capacity, and crews, the ultimate goal is to integrate both freight and passenger trains on the same network to obtain the highest efficiency of the rail system. Technological innovation and implementation aside, the expansion of higher speed rail service requires a robust demand for the service. Kimon Proussaloglou, a Principal at Cambridge Systematics, enthusiastically shared the complexity of demand forecasting for the audience. Factors affecting the quality and detail of a travel demand forecasting study, according to Proussaloglou, are schedule and budget limits, data availability and its quality, and a forecaster’s skills in finding the balance between what the theory dictates and what the available data, schedule and budget allows. Even though a base year forecast can be quite accurate, long term forecasts (e.g. 20-30 years) are prone to errors. Therefore, he advocated using sensitivity analyses to evaluate “what if” scenarios for various socioeconomic assumptions, land use choices and impacts, gasoline prices, population, technology changes, and changes in the service of competing modes, among others. Frank Koppelman, Emeritus Professor of Civil and Environmental Engineering at Northwestern University, wrapped up the symposium and discussed the role of peer review committees on high-speed rail studies. The primary purpose of independent review committees, especially as it relates to demand forecasting, is to ensure the integrity of any HSR business (investment) case by undertaking a scientifically rigorous review of analytical methods used, the execution of those methods, and the ensuing results, reports and recommendations. As concluded by Professor Koppleman, a peer review committee can provide guidance throughout the process, as well, to improve the quality of forecasts, clarify sensitivity to key variables and provide a realistic and independent risk assessment. A key takeaway from the symposium was the need for innovative technologies and methods for scheduling, forecasting, operations, and rail car performance. Professor Jakob Eriksson, Department of Computer Science at the University of Illinois at Chicago (UIC), discussed improving the transit experience for the rider using “TransitGenie.” TransitGenie is a context-aware, real-time transit navigation system application for the iPhone, and is currently available for a free download at the iTunes App store. Developed in the BITS Networked Systems Laboratory at UIC, TransitGenie makes route recommendations based the real-time locations of tracked buses and trains, as well as the current location of the user. Eriksson’s lecture highlighted the difficulty of rolling out a user-friendly commuter “commercial” application for a regional commuter network that lacks a high level of integration or interoperability. Transportation information systems require the acquisition of raw data for data processing. In the Chicago area, the Chicago Transit Authority provided access to data online and Pacebus, the suburban bus operator, asked for help to retrieve their own data. Metra, the commuter rail operator, was initially hesitant to the idea. However, after further conversations, Metra became helpful and provided useful data. In addition to solving data gathering challenges, Eriksson and the BITS Lab had to overcome several other technical challenges: smartphone energy consumption; GPS accuracy in urban canyons (and tunnels); route matching; mode classification (are we on a bus or walking, etc.? ); and location privacy, among others. With more than 30,000 downloads in the Chicago area, TransitGenie is a technology transfer success in the making, and may be a model for others to improve the “user experience” in transportation. On January 12, 2011, the Chicago Metropolitan Agency for Planning (CMAP) appointed Director Bret Johnson to its Economic Development Committee. The charge to the Committee is to assist CMAP with the implementation of its GOTO 2040 regional plan for the seven counties and 284 communities that comprise the Chicago metropolitan area. Notably, the Economic Development is tasked with providing guidance and recommendations on two specific areas of the plan: Improve Education and Workforce Development and Support Economic Innovation. The Committee is chaired by Lance Pressl, President of the Chicagoland Chamber of Commerce Foundation, who also holds a BS, MS, and PhD in Political Science from Northwestern University. One of the key recommendations of GOTO 2040 is to evaluate the Chicago region’s clusters of industrial specialization in order to identify workforce, infrastructure, financing needs, and to provide strategies for coordination and communication. CMAP’s first task in this process will be to tackle the enormous freight and logistics industrial base in the Chicago area. CCITT Principal Investigator Diego Klabjan’s research on electric vehicle (EV) charging stations was recently featured in RITA’s UTC Spotlight. Klabjan’s CCITT-funded research project aims to use innovative analytical methodologies to determine best locations for EV charging stations in the Chicago area. Read the full article here.